Raised planters, to be used for growing vegetables and herbs, follow the existing brick steps coming up from the house deck to the pathway running along the back of the house. Along the rear of the retained area, a low, gently curving, rustic brick wall that had to be removed during excavation is currently being rebuilt. Sleeper steps will lead to the garden and small orchard above. The area that will be paved is currently being prepared with basecourse. The clients have selected small pavers for this area, which makes our job of cutting to cut to fit the curved brick wall behind easier! Once the paving is down the rest of the retained area will be prepared for putting down lawn. Getting material onto, or off, a hillside site can often be tricky. At this site we have constructed a chute from the road above to get material onto site. 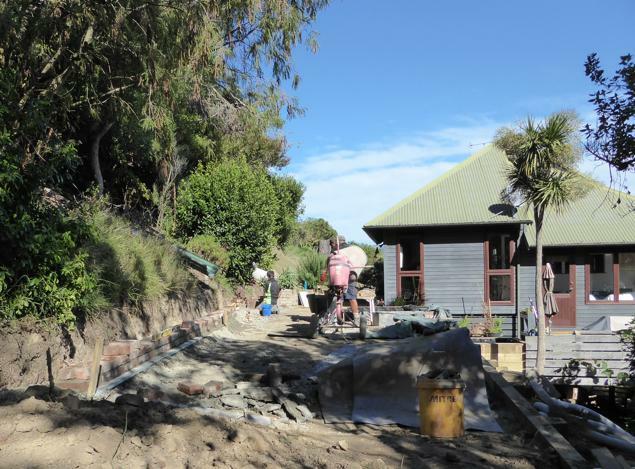 Luckily we have not had to remove any material that was excavated, it’s all been used as backfill for the retaining wall.